PD-1 is one of the check-point modulator proteins expressed on activated T cells, while PD-L1 is PD-1 ligand most often expressed on antigen-presenting cells including macrophages and dendritic cells. PD-L1 is also upregulated in many tumor cells which can bypass the attack by T cells through interaction with PD-1. In order to facilitate PD-1/PD-L1 antibody development, we engineered a chimeric PD-1 receptor (CPR) which, when ligated by PD-L1, can transduce a stimulating signal to Jurkat cells stably expressing CPR . 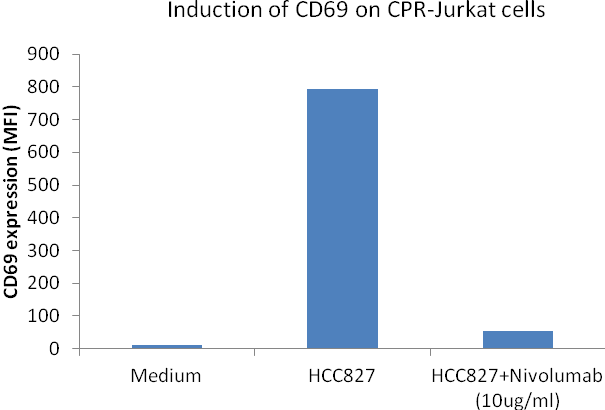 To test if ligation of CPR by PD-L1 could activate Jurkat cells, 5x10 of HCC827 NSCLC cells (PD-L1 positive) were co-cultured with 25x10 of Jurkat-CPR- Clone# 1C8 cells, in the presence or absence of PD-1 blocking antibody Nivolumab, in 250ul of RPMI-1640 (plus 10% FBS) in a 48-well plate for 24 hours at the condition of 37oC, 5% CO2. Jurkat cells were harvested gently and stained with PE-conjugated CD69 antibody.